Back in September of 2011 I wrote a review of defictionalized Cheesy Poofs. In the article I mentioned my love for the Suncoast Motion Picture Company and said I would write more about it later. I love the Suncoast Motion Picture Company today just as much as I did when it was still only 15 miles or so away from me in Sioux Falls when I lived in Hartford. I would frequent the store, browsing and downright loitering every time I visited the mall (frequently). The thing about the Suncoast Motion Picture Company was... sure, they had VHS tapes. That is where I bought my video copies of "Mystery Science Theater 3000: the Movie", "Monty Python and the Quest for the Holy Grail", and saw a physical copy of "The Garbage Pail Kids Movie" (dear lord, do not watch it)... And it was the first place I bought a DVD when those started showing up in stores. I think they used to sell laser discs as well. The thing about the Suncoast Motion Picture Company was... yes, they had CDs and comic books. Suncoast was the first time I realized that "Tank Girl" was a comic book before it was a movie. They had a copy of one of the trades. I thumbed through it and swore one day to own it. (I have read it more than once, but do not own a copy as of yet). The thing about the Suncoast Motion Picture Company was that they were the first place I found defictionalized products! Suncoast had the first box of real life Cheesy Poofs I ever tried. Suncoast had the only for-human-consumption Scooby Snacks I've ever seen (and purchased, I'd love to find them again so I could do a review). When the movie version of "The Hitchhiker's Guide to the Galaxy" came out, Suncoast had the knitted version of the characters. They were amazing. Suncoast had lots of toys, including the scary Todd McFarlane fairy tale toys, Space Ghost: Coast to Coast toys, and decks of cards in over-sized fictional beer and soda cans. There were so many reasons to love the Suncoast Motion Picture Company... is what I'm trying to say. Suncoast was around before I knew that I could get almost anything in the store off of the internet. Given the choice I would still go to Suncoast instead of using giant online stores (amazon.ca, what's the website for that?). I even applied to work at Suncoast one summer. They took my application and told me that they thought there might be a position opening up soon. They never called me back. 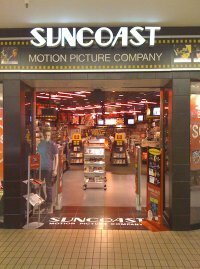 When I was researching Cheesy Poofs for the 2011 post I found out that there was still a Suncoast Motion Picture Company store open at the Fort Wayne mall in Indiana! I got unreasonably exited about it and decided to visit right away so I could write an article about it for the pondercouch. So I finally got around to it a few weeks ago. We walked all over the mall, hoping to happen upon it. I'd even looked online and saw that there were pictures of it on yelp from 2012. So it had to still be there, right? After we walked around the mall we broke down and looked at the directory. The directory still listed it. We checked the place the directory said it should be and it was a Forever 21 or some other such nonsense. I fought back man-tears as we got some food court pizza (me) and cheese steaks (them). 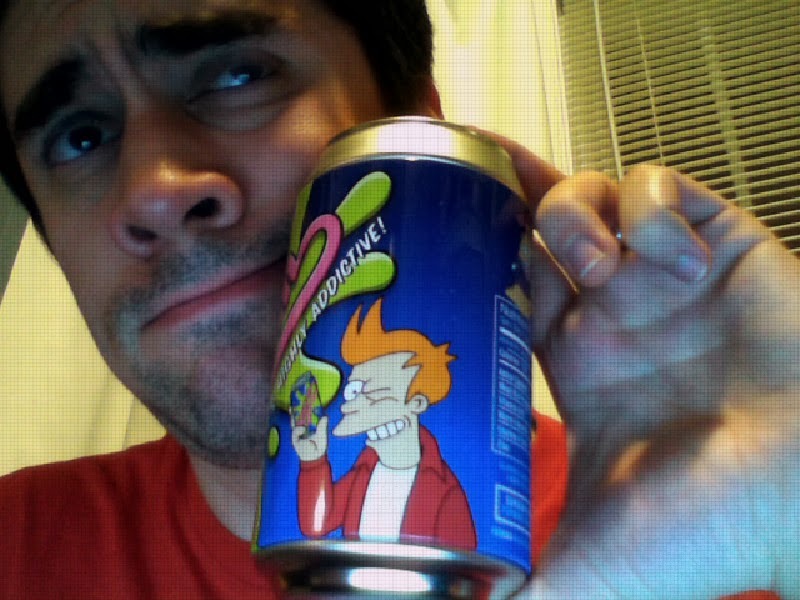 I got some Funyuns, too. As we ate I looked up and called the Suncoast store number. It was out of service. We had been defeated by the higher powers. And my poor planning/research skills. 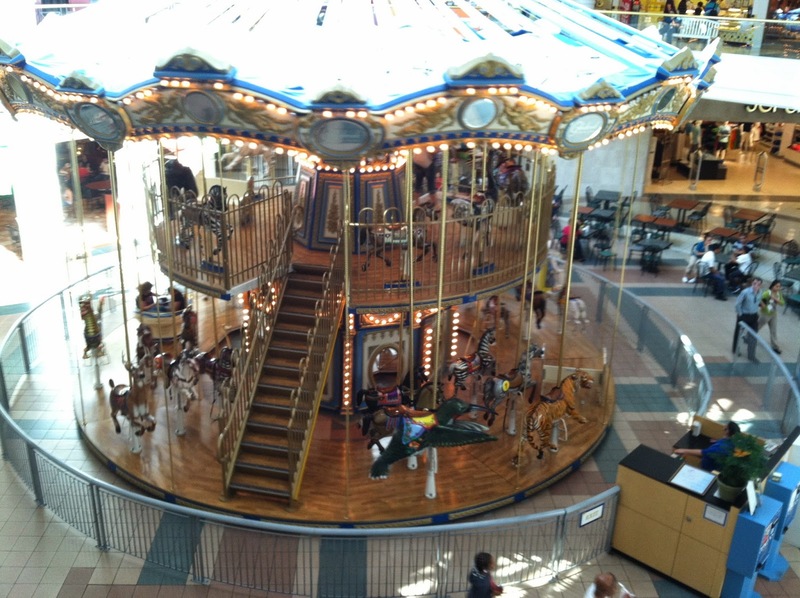 At least there was a wicked-awesome 2 story carousel next to the food court that we could watch as we ate and I sulked. On our way into town we noticed a store near the mall named "Ollie's Bargain Outlet"! We had to check it out! It turns out Ollie's is full-to-the-roof with marked down merch. From the website: "Ollie’s Bargain Outlet is one of America’s largest retailers of closeouts, excess inventory, and salvage merchandise." Every section has a sign with a great drawing of Ollie with some kind of pun or play on words relating the merchandise in that section. You have everything for Christian YA novels to Cheese Doodles to jumpsuits that would be perfect for a Ghostbusters cosplay! We loved it! 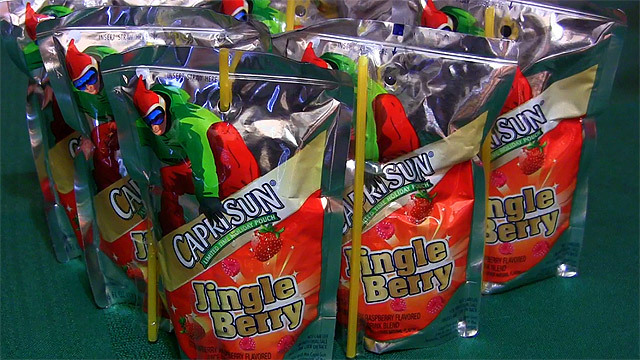 Geoff bought some off-season Capri Sun Jingle Berry Juice. All-in-all, it was a great trip. A mind blowing article is provided here. And it is written with great skill and the words directly explain the thought of author and it is nice to know the information provided around the Earth and really it is great topic of interest. Visit dvdmakers.com.au for VHS to DVD Transfer.